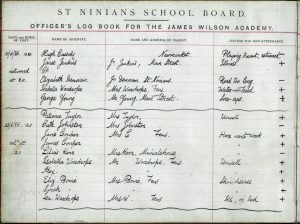 Schools in Scotland were regularly inspected by H.M. 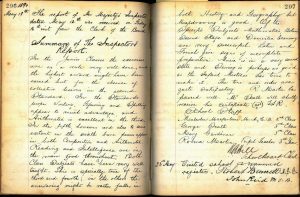 Inspectors of Schools and summaries of the reports received were often written up in the school log book by the Head Teacher. Local School Board officials also visited schools to inspect the children and the registers to make sure that the records were being kept correctly. 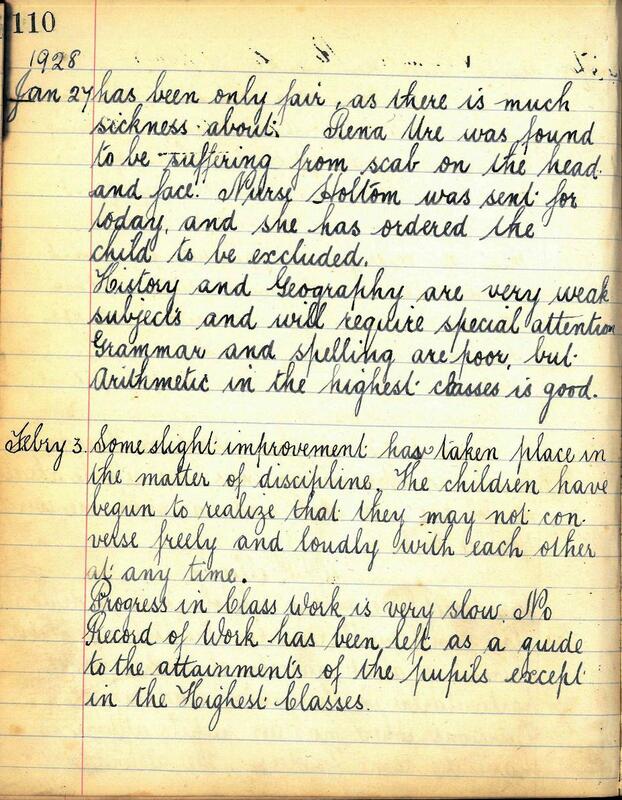 These entries in the school logs give a good idea of what life was like for children in schools in the past and are useful for social history. 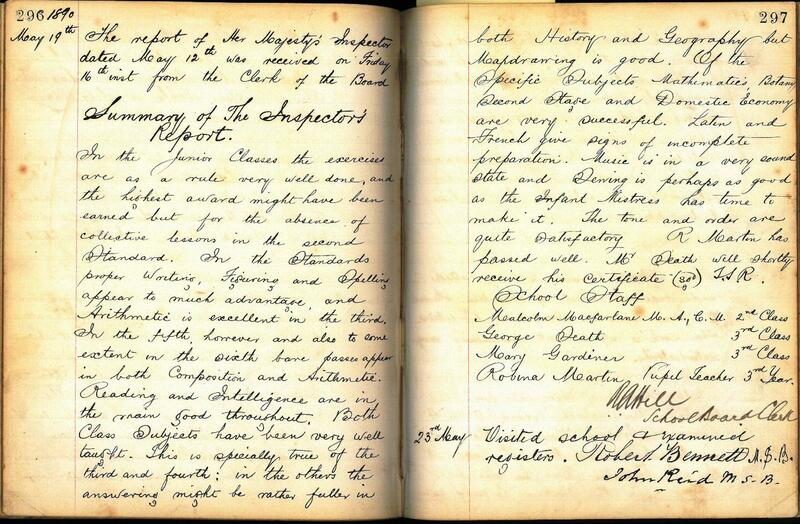 This Inspector’s Report for Bridge of Allan Primary School in 1890, written up in the log book, gives a good overview of what was studied at the school at this time. The pupils studied writing, figuring and spelling, arithmetic, composition, reading, history, geography (including map drawing), mathematics, botany, domestic economy, Latin, French, music and sewing. A comprehensive education! 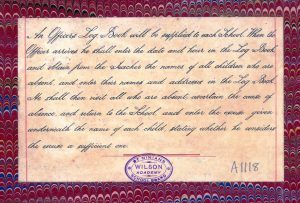 A list of staff working at the school is also given. Although it looks as if the Head Teacher was called George Death, it is actually Seath. 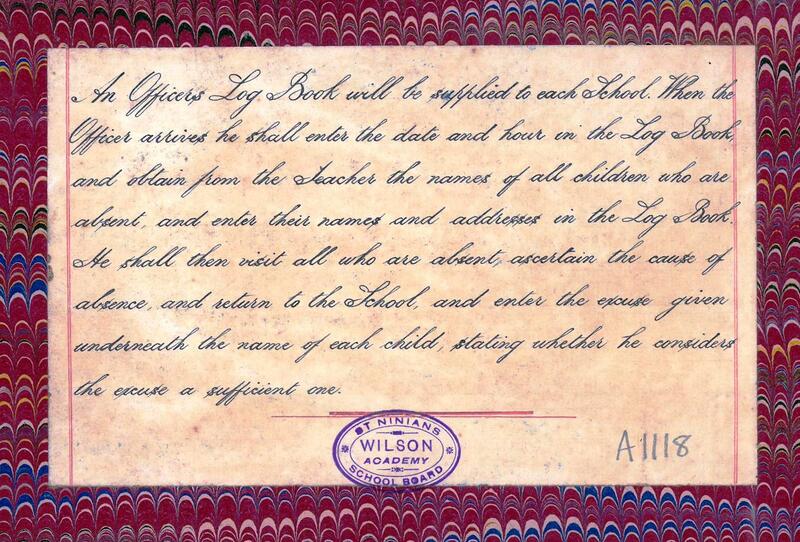 Handwriting can be challenging in these records. 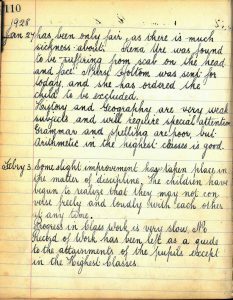 Sometimes the Head Teacher records their own impressions in the log books as in this extract from the log of Port of Menteith Primary School from January 1928. 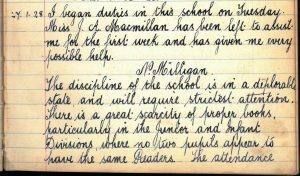 P. Milligan has just taken up the post of Head Teacher and records his rather damning assessment of the school at the beginning of the post. 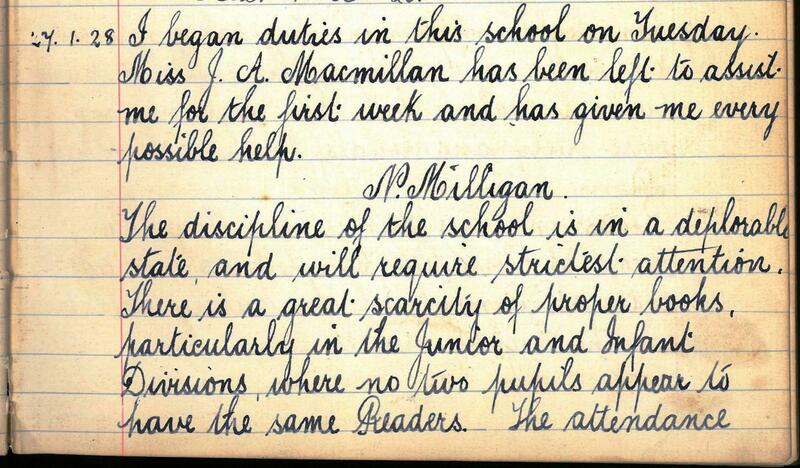 Not only is pupil discipline ‘in a deplorable state’ but ‘there is a great scarcity of proper books, particularly in the junior and infant divisions, where no two pupils appear to have the same Readers.’ He also notes that ‘History and Geography are very weak subjects and will require special attention’. By February, he is recording ‘some slight improvement’ in discipline although by his tone, we gather that there is a long way to go before he will be happy with everything at the school. Absences are often recorded in the log books and in the admission registers. 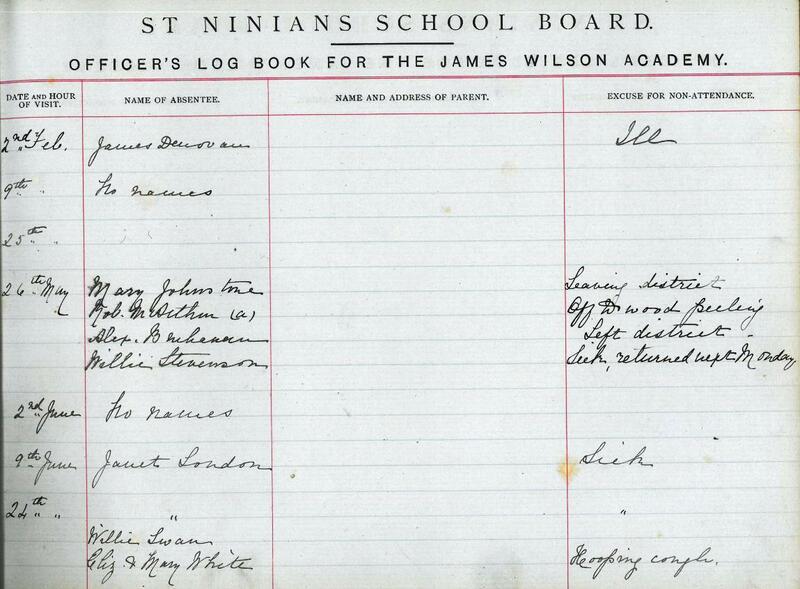 This record from James Wilson Academy in Bannockburn is a register of absences kept by the School Board from 1885. This label in the front of the volume gives instructions as to how the record is kept. The School Board official was to take the names of those absent and visit their homes, recording the information that he gathered from his visits in the register. 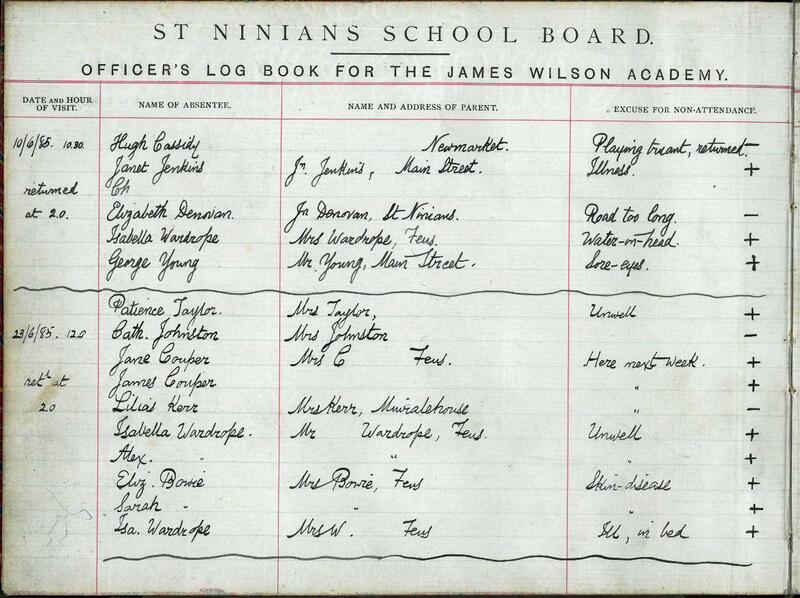 The entries in the volume are interesting as they give an idea of not only what illnesses the children suffered from but also how many were regularly truanting from school.